That's how many jobs will ultimately be created at a planned new Volvo car factory in South Carolina, in which the now Chinese-owned firm will invest some $500 million dollars in building its first North American factory. What makes it even bigger news is South Carolina governor Nikki Haley telling the United Auto Workers union its presence isn't wanted at the new plant, citing a recent failure of the International Association of Machinists and Aerospace Workers to unionize a relatively new Boeing factory in the state. Haley's opinion was of course rejected strongly by UAW leaders, setting up a likely battle royal at the new plant similar when it opens in 2018 to the high stakes drama that saw unionization voted down at a Volkswagen factory in Tennessee early last year. That may be the disappointing long term growth rate ceiling in the US, according to Bank of the West chief economist Scott Anderson, after a second estimate of Q1 2015 real US GDP came in at a very disappointing -0.7% annual rate, down from the initial estimate of just +0.2%. That likely dooms full year 2015 real GDP to something not much more than 2% again at best for all of 2015, just as a poor Q1 did for last year's full year measure, as the current multi-year recovery in the US continues to be below historical norms. We'll note some economists think there may be some issues with the Commerce Dept. GDP model, which have been showing low growth in Q1s for several years, perhaps from not handling seasonality right. 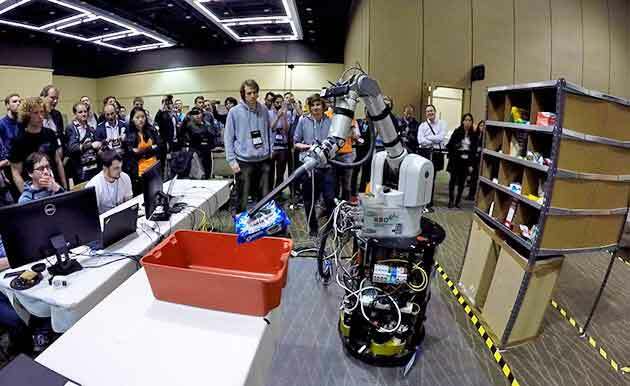 That was the number of items ranging from a rubber ducky to pencils to a small pack of Oreo cookies that the robot of the winning team was able to successful pick out of 12 total items during last week's "Amazon Picking Challenge" contest in Seattle. The task required the robots to grab each item from some static shelving and place it in a nearby tote. The winning robot was developed by a team Technical University of Berlin, which like everyone else used commercially available devices such as robotic arms as a platform, to which it added its own software controls and grabber mechanisms. In second place was a team from MIT that was able to pick and place 7 of 12 items. Picking items off shelves in an "unstructured environment" has to date defied automation, Amazon said. BTW, it took the winning robot about 20 minutes to do the job. That's the share of total per container cost savings touted by container shipping lines that are coming simply from more fuel efficient engines, not from the increased scale, according to a new report from the International Transport Forum, and arm of the Organization for Economic Co-operation and Development (OECD). The gist of the report is that the savings from ever larger ships - with the most recent designs capable of carry some 20,000 twenty-foot equivalent units (TEU) - is showing diminishing returns, and that the end savings to shippers and importers may not even materialize because of the havoc the megaships are having on port operations across the globe and other factors, calling on regulators and policy makers to take a more balanced view. We'll note Maersk Line disputes some of the findings, saying recent cost gains are larger than calculated by the ITF.